Add onions, oil(or broth/water) , pinch of salt and pepper to a large non stick skillet set to medium heat. Sautés for 5 minutes, till onions are softening and slightly brown, then add garlic and sausage(s), cook for another 3 minutes or so to crisp the sausage a bit. Add the celery, peppers, mushrooms and cook for 10 minutes or so till veggies are softening but the celery and peppers still have a slight bite to them. Add in the herbs, salt and spices, give it a stir. Turn off the heat. Now add the diced apple, cooked rice and veggie stock, give it a mix. Add the toasted cubed bread and mix till combined, Taste for seasonings, add more salt, pepper and or poultry seasoning if needed. If mix seems to dry add little more veggie stock. I find 1 cup of vegetable stock is perfect. 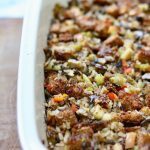 I usually use a hearty sprouted whole grain bread for my stuffing recipe or a mix of hearty and whole wheat. I find softer bread tends to get mushy. If you use Ezekiel bread you’ll need more than 7 slices as the bread is sliced very thin. I usually use Squirrelly Bread for this stuffing. To make this gluten free, use gluten free bread and use gluten free vegan sausages or omit them.